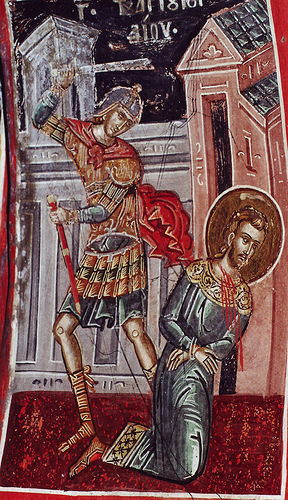 The Martyr Gordius was born at the end of the third century in the city of Caesarea of Cappadocia into a Christian family. When he came of age, he entered military service. Because of his valor and military skill, he was made a centurion. 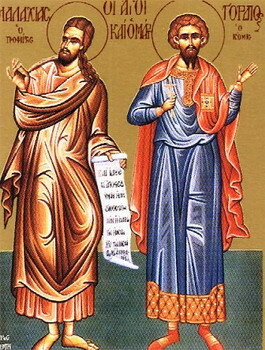 During the persecution of Christians at the beginning of the fourth century, he left the world and settled in the Sinai desert to prepare himself for the good deed of confessing the Name of Christ the Savior. In the year 320, Gordius openly appeared before the prefect of a city where pagan games were being held, and identified himself as a Christian. He was arrested, suffered terrible torments, then was beheaded. through his suffering has received an incorruptible crown from You, our God. and shattered the powerless boldness of demons. Through his intercessions, save our souls! Podoben: "The universe offers You..."
the blood you shed has made the universe rejoice. fittingly honoring you, divine and glorious martyr, worthy of all praise.